All of a sudden, the Cowboys’ seemingly endless string of moves at the linebacker position this spring makes sense. Rolando McClain was suspended four games on Thursday afternoon for violating the NFL’s substance abuse policy â which shouldn’t come as much of a surprise, given that he had already been fined for a similar infraction in February. 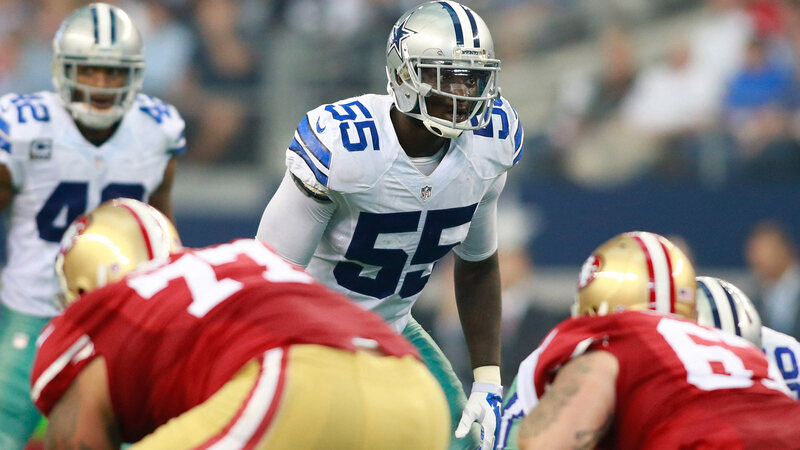 The Cowboys caught a glimpse of McClain’s capabilities last season, when they traded for him, seemingly as an afterthought, in the wake of Sean Lee’s ACL injury. When he was healthy he was a force in the middle of the Dallas defense, notching 81 tackles and two interceptions in 13 games. A seemingly endless array of injuries and maladies took their toll, though, and the veteran’s productivity faded during the Cowboys’ run toward the playoffs. When the postseason arrived, he left both playoff games early with concussion symptoms. The Cowboys re-signed McClain in the spring to an incentive-laden, one-year contract â but they didn’t stop there. All of a sudden, the decision to sign veteran Jasper Brinkley to a two-year, $6.5 million contract in March looks like a smart move. No one’s likely to confuse Brinkley’s athleticism and ability with McClain’s, as McClain was a top 10 pick in the NFL draft. But the longtime Minnesota Viking does boast something McClain has lacked â consistency. Brinkley was a fifth-round draft pick in 2009, and he has appeared in at least 15 games during five of his six NFL seasons. The only real absence of his career came in 2011, when a hip injury forced him out for the entire season. Aside from the decision to sign Brinkley, give the Cowboys credit for the manner in which they cross-train their linebackers at multiple positions within their scheme. As a result of McClain’s injuries last year, Anthony Hitchens got plenty of experience playing middle linebacker, and is another option worth considering. Hitchens is widely expected to compete for the starting spot at strong side linebacker, but that could change with McClain sitting out for the first month of the season. As a rookie, Hitchens made 84 tackles in 18 games and showed flashes at all three linebacker spots. There’s also the possibility the Cowboys could opt to move their old middle linebacker, Sean Lee, into his familiar position. But that seems unlikely, given Lee’s history of injury â not to mention the amount of importance the Dallas coaching staff puts on Lee’s new position on the weak side. Finally, there’s the addition of Damien Wilson from Minnesota in the fourth round of this spring’s draft. Last month, linebackers coach Matt Eberflus said he wasn’t yet sure where Wilson would factor as a rookie, but you can bet the Cowboys will train him in a variety of places. It’s hard to expect much from any rookie, let alone a fourth-rounder â but Hitchens’ successes last year certainly make it plausible that Wilson could be an early contributor. It’s definitely not an ideal scenario, as there’s no denying McClain’s talent when he’s healthy and available to be counted on. As opposed to last year, however, the Cowboys have left themselves no shortage of contingency plans to deal with this suspension.